Enjoy one of the traditional Thanksgiving side dishes -- cornbread -- as a breakfast item! These Blueberry Cornbread Muffins are a real treat. Preheat oven to 400°F / 205°C. Line a muffin tin with baking cups. In a large bowl, mix together the flour, cornmeal, baking powder, salt and baking soda. In a food processor, process the corn, buttermilk, brown sugar, and honey until combined, about 5 seconds. Add eggs and process until well combined, another 5 seconds. There will be small lumps of corn remaining. Make a well in the middle of the dry ingredients and pour the corn mixture into the well. Fold a few times to start combining. Add in the melted butter and blueberries. Fold until the wet ingredients are just moistened. Evenly divide the batter into the muffin cups. Sprinkle the granulated sugar evenly on top. Bake the muffins until the tops of the muffins are golden brown and a toothpick inserted into the middle of the muffins come out clean, about 22-25 minutes. Allow to cool in the pan for about 5 minutes, then transfer the muffins to a cooling rack to further cool. Serve the muffins warm with a touch of honey. Recipe adapted from Cook's Illustrated The Science of Good Cooking. 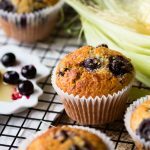 Get this recipe for Blueberry Cornbread Muffins at https://www.theworktop.com/breakfast-brunch-recipes/blueberry-cornbread-muffins/.